How To File a Claim. 1. Have Parent/Guardian of injured participant or injured adult participant complete and sign appropriate sections of claim form. Download "How To File a Claim. 1. Have Parent/Guardian of injured participant or injured adult participant complete and sign appropriate sections of claim form." 1 How To File a Claim The Claim Form (M18979) is prepared by the Girl Scout volunteer or another authorized person, usually one who was at the scene of the accident and familiar with the circumstances. 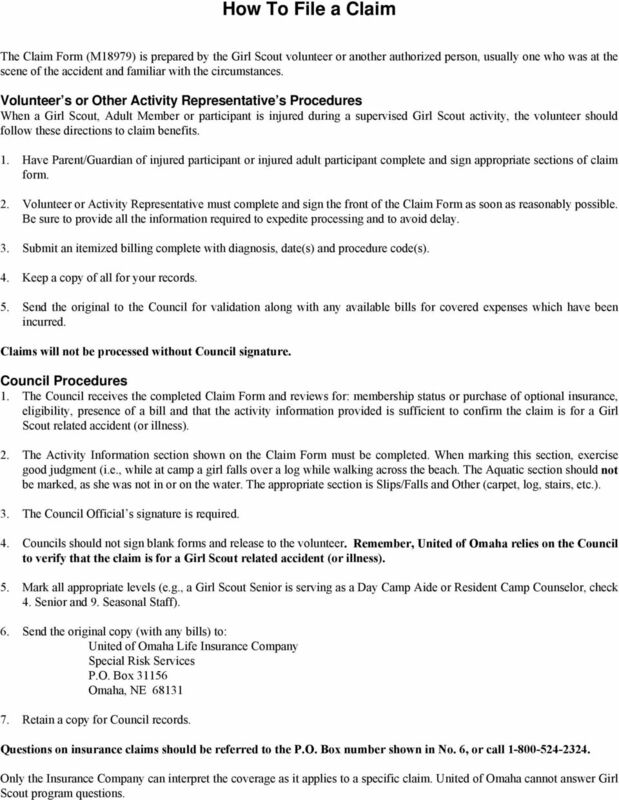 Volunteer s or Other Activity Representative s Procedures When a Girl Scout, Adult Member or participant is injured during a supervised Girl Scout activity, the volunteer should follow these directions to claim benefits. 1. Have Parent/Guardian of injured participant or injured adult participant complete and sign appropriate sections of claim form. 2. Volunteer or Activity Representative must complete and sign the front of the Claim Form as soon as reasonably possible. Be sure to provide all the information required to expedite processing and to avoid delay. 3. Submit an itemized billing complete with diagnosis, date(s) and procedure code(s). 4. Keep a copy of all for your records. 5. Send the original to the Council for validation along with any available bills for covered expenses which have been incurred. Claims will not be processed without Council signature. Council Procedures 1. The Council receives the completed Claim Form and reviews for: membership status or purchase of optional insurance, eligibility, presence of a bill and that the activity information provided is sufficient to confirm the claim is for a Girl Scout related accident (or illness). 2. 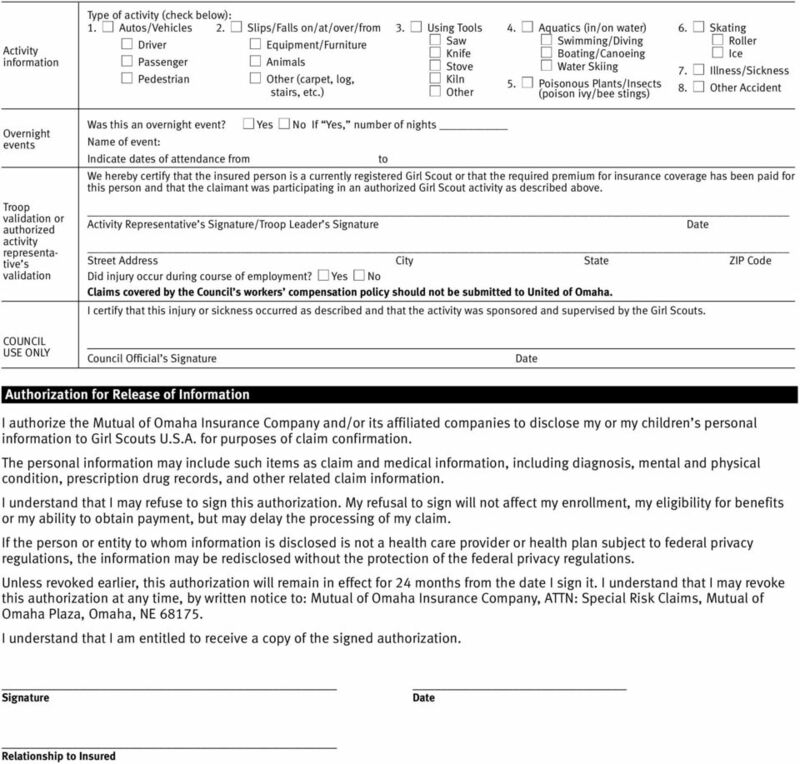 The Activity Information section shown on the Claim Form must be completed. When marking this section, exercise good judgment (i.e., while at camp a girl falls over a log while walking across the beach. The Aquatic section should not be marked, as she was not in or on the water. The appropriate section is Slips/Falls and Other (carpet, log, stairs, etc.). 3. The Council Official s signature is required. 4. Councils should not sign blank forms and release to the volunteer. Remember, United of Omaha relies on the Council to verify that the claim is for a Girl Scout related accident (or illness). 5. Mark all appropriate levels (e.g., a Girl Scout Senior is serving as a Day Camp Aide or Resident Camp Counselor, check 4. Senior and 9. Seasonal Staff). 6. Send the original copy (with any bills) to: United of Omaha Life Insurance Company Special Risk Services P.O. Box Omaha, NE Retain a copy for Council records. Questions on insurance claims should be referred to the P.O. Box number shown in No. 6, or call Only the Insurance Company can interpret the coverage as it applies to a specific claim. United of Omaha cannot answer Girl Scout program questions. 5 ** Maine, Tennessee, Virginia, Washington: It is a crime to knowingly provide false, incomplete or misleading information to an insurance company for the purpose of defrauding the company. Penalties may include imprisonment, fines or denial of insurance benefits. ** Maryland: Any person who knowingly or willfully presents a false or fraudulent claim for payment of a loss or benefit or who knowingly or willfully presents false information in an application for insurance is guilty of a crime and may be subject to fines and confinement in prison. ** Minnesota: A person who files a claim with intent to defraud or helps commit a fraud against an insurer is guilty of a crime. ** New Hampshire: Any person who, with a purpose to injure, defraud, or deceive any insurance company, files a statement of claim containing any false, incomplete, or misleading information is subject to prosecution and punishment for insurance fraud, as provided in RSA 638:20. ** New Jersey: Any person who knowingly files a statement of claim containing any false or misleading information is subject to criminal and civil penalties. ** New Mexico: ANY PERSON WHO KNOWINGLY PRESENTS A FALSE OR FRAUDULENT CLAIM FOR PAYMENT OF A LOSS OR BENEFIT OR KNOWINGLY PRESENTS FALSE INFORMATION IN AN APPLICATION FOR INSURANCE IS GUILTY OF A CRIME AND MAY BE SUBJECT TO CIVIL FINES AND CRIMINAL PENALTIES. ** New York: Any person who knowingly and with intent to defraud any insurance company or other person files an application for insurance or statement of claim containing any materially false information, or conceals for the purpose of misleading, information concerning any fact material thereto, commits a fraudulent insurance act, which is a crime, and shall also be subject to a civil penalty not to exceed five thousand dollars and the stated value of the claim for each violation. 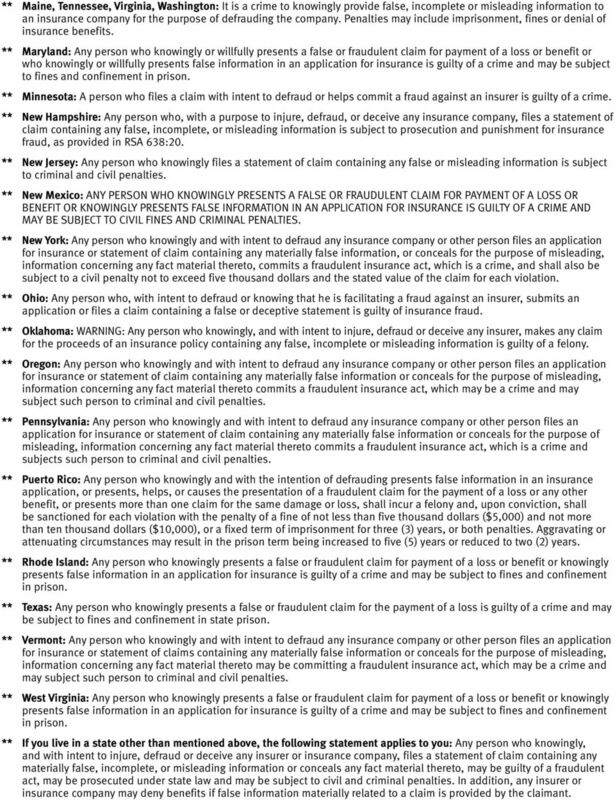 ** Ohio: Any person who, with intent to defraud or knowing that he is facilitating a fraud against an insurer, submits an application or files a claim containing a false or deceptive statement is guilty of insurance fraud. ** Oklahoma: WARNING: Any person who knowingly, and with intent to injure, defraud or deceive any insurer, makes any claim for the proceeds of an insurance policy containing any false, incomplete or misleading information is guilty of a felony. ** Oregon: Any person who knowingly and with intent to defraud any insurance company or other person files an application for insurance or statement of claim containing any materially false information or conceals for the purpose of misleading, information concerning any fact material thereto commits a fraudulent insurance act, which may be a crime and may subject such person to criminal and civil penalties. ** Pennsylvania: Any person who knowingly and with intent to defraud any insurance company or other person files an application for insurance or statement of claim containing any materially false information or conceals for the purpose of misleading, information concerning any fact material thereto commits a fraudulent insurance act, which is a crime and subjects such person to criminal and civil penalties. ** Puerto Rico: Any person who knowingly and with the intention of defrauding presents false information in an insurance application, or presents, helps, or causes the presentation of a fraudulent claim for the payment of a loss or any other benefit, or presents more than one claim for the same damage or loss, shall incur a felony and, upon conviction, shall be sanctioned for each violation with the penalty of a fine of not less than five thousand dollars ($5,000) and not more than ten thousand dollars ($10,000), or a fixed term of imprisonment for three (3) years, or both penalties. Aggravating or attenuating circumstances may result in the prison term being increased to five (5) years or reduced to two (2) years. ** Rhode Island: Any person who knowingly presents a false or fraudulent claim for payment of a loss or benefit or knowingly presents false information in an application for insurance is guilty of a crime and may be subject to fines and confinement in prison. ** Texas: Any person who knowingly presents a false or fraudulent claim for the payment of a loss is guilty of a crime and may be subject to fines and confinement in state prison. ** Vermont: Any person who knowingly and with intent to defraud any insurance company or other person files an application for insurance or statement of claims containing any materially false information or conceals for the purpose of misleading, information concerning any fact material thereto may be committing a fraudulent insurance act, which may be a crime and may subject such person to criminal and civil penalties. ** West Virginia: Any person who knowingly presents a false or fraudulent claim for payment of a loss or benefit or knowingly presents false information in an application for insurance is guilty of a crime and may be subject to fines and confinement in prison. ** If you live in a state other than mentioned above, the following statement applies to you: Any person who knowingly, and with intent to injure, defraud or deceive any insurer or insurance company, files a statement of claim containing any materially false, incomplete, or misleading information or conceals any fact material thereto, may be guilty of a fraudulent act, may be prosecuted under state law and may be subject to civil and criminal penalties. In addition, any insurer or insurance company may deny benefits if false information materially related to a claim is provided by the claimant. GROUP SHORT-TERM DISABILITY STATEMENT OF EMPLOYEE 1. Full Name (last, first, middle initial) 2. Social Security Number 3. Phone Number (include area code) 4. Street Address & Mailing Address 5. City 6. The forms must be completed by a qualified person and signed with their occupational title as per its respective form. Your ability to work and generate income is your greatest asset. If a disability ever left you unable to work, a combination of increased expenses and loss of income could create financial difficulties. To file a claim: If you have any questions or need additional assistance, please contact our Claim office at 1-800-811-2696. This form is to be submitted for services rendered by a provider outside of the EyeMed provider network. You also may have purchased the Hospital Cash Rider and/or the Disability Income Benefit Rider. Refer to your policy for detail information. Your Critical Care policy is supplemental health insurance to help cover the additional expenses associated with a critical illness diagnosis. Your Critical Care policy is supplemental health insurance to help cover the additional expenses associated with a critical illness diagnosis. The Critical Care Benefit is a one time lump sum payment. FAX this direction If your name has changed, attach a copy of your driver s license or other legal documentation. Hospital Confinement/Outpatient Surgery Claim FAX this form: 1-800-880-9325 Or mail: P.O. If your claim is within the policy s contestability period, we may request additional information. 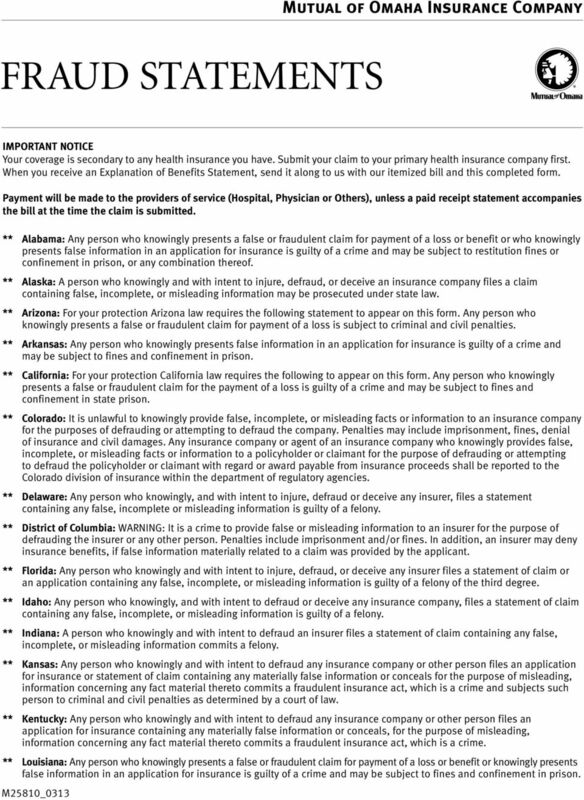 American General Assurance Company Proof of Death Claim Claimant s Statement CLAIMANT S STATEMENT: COMPLETE, SIGN AND DATE THIS FORM, THE AUTHORIZATION FOR RELEASE OF INFORMATION AND THE FRAUD STATEMENT. Colonial Life & Accident Insurance Company, Columbia, SC DISABILITY FAX: 1-800-880-9325 Telephone: 1-800-325-4368. AAU Registered Member Sports Accident Claim Procedure AAU members may be eligible for medical expense benefits for treatment of covered injuries sustained while participating in AAU Licensed activities. Thank you for this important information. Should you have any questions, please call us at (800) 541-3522. Dear Policyholder: Please complete and sign the attached claim form. Additionally, the following are items needed in order to process your Travel Delay claim in the most efficient and expedient way possible. Toll-free: 1-800-635-5597 Fax: 1-800-447-2498 Call toll-free Monday through Friday, 8 a.m. to 8 p.m. Eastern Time. 10. Can I fax my claim form? Yes, we can accept faxes at 508-853-2867; we also ask that the original be sent via mail. Our fax number appears in the upper left-hand corner of our Claim Forms for your convenience. INSTRUCTIONS The employer/administrator must complete the claim form as indicated and send attachments mentioned below. We will advise you if further documentation is necessary to complete the claim process. Thank you. Should you have any questions, please call us at (800) 541-3522. Continue your Aetna life insurance coverage with these options. 2. 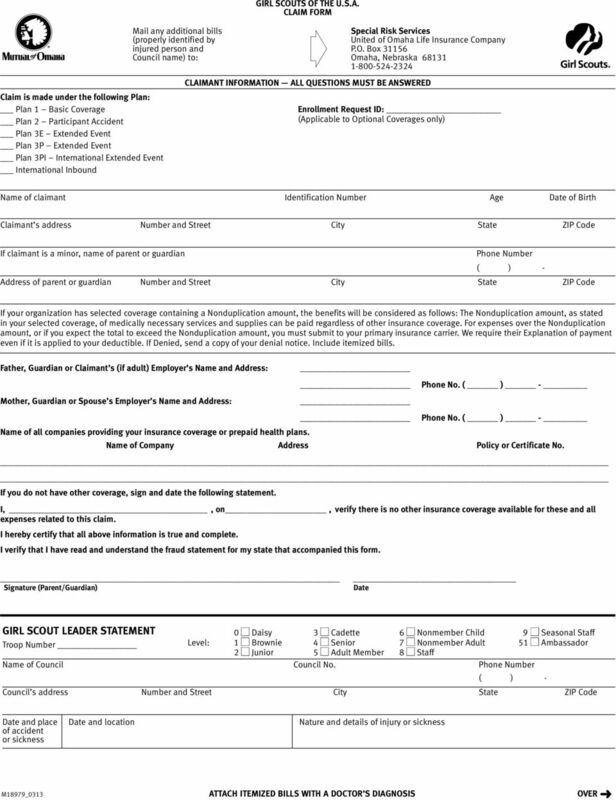 Original, photocopies or screen-print of enrollment form, including beneficiary changes. > Hole-In-One Application All questions must be answered in full. Application must be signed and dated by the applicant. Name of Employer Group Report # Sub-Code # (Sub-Division) Sub-Point # (Branch) Research Foundation for Mental Hygiene, Inc.